Quick and secure data-sharing means your clients can share their financial data with you with a flick of a switch, anywhere, anytime. 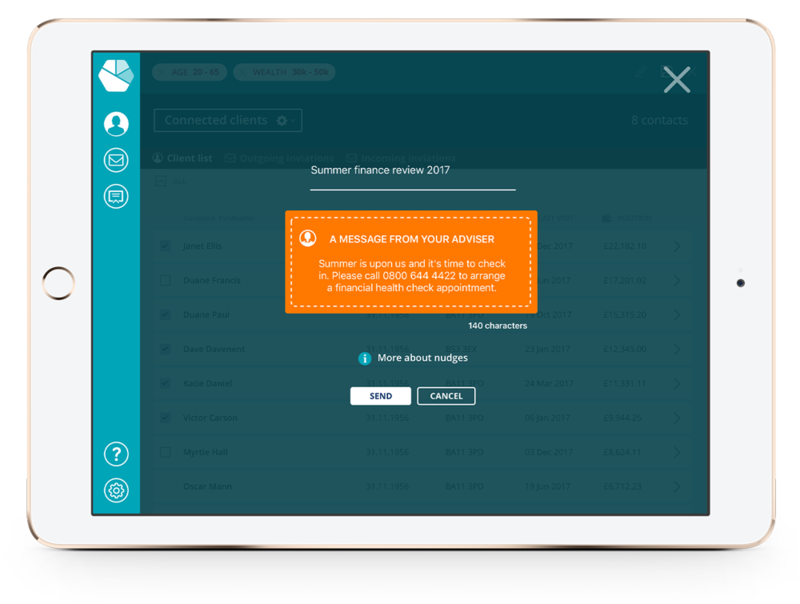 For the first time, clients can see all of their financial accounts aggregated in one place and securely share this with their advisers at the click of a button. Advisers in turn, link their managed pensions and investments to provide consumers with a holistic, 360 degree, financial view. Simple account onboarding allows both the adviser and client to immediately understand personal spending and saving behaviours. Moneyhub provides automated daily updates and intelligently categorises income and expenditure. This extra layer of user intelligence, combined with existing customer information will strengthen engagement and identify specific financial needs. Moneyhub facilitates faster and more accurate fact finding for advisers through a secure connection to customers' financial information. Advisers can now see an up-to-date view of the client’s entire portfolio alongside an income and expenditure analysis and cash flow. Automated daily categorised transactions built using Moneyhub's proprietary algorithms mean users and their financial adviser will always see an overall current financial position. This accelerates the financial intelligence of everyday and long term money management and supports the client's financial wellbeing. Using machine learning and artificial intelligence, wealth management firms can provide clients with an engaging digital solution that helps them take control of their finances. Data surfaced from users' financial behaviour provides advisers with crucial insight to client needs. Moneyhub becomes the ideal proactive aide to nudge clients, segmented based on demographic or financial information, with relevant financial services and helpful investment recommendations based on unique insight to grow your business.